TLP-IASbaba - Day 65 – Q 1. Offlate many countries have been moving away from the international treaties for economic progress. How justified is it in terms of environmental ethics? Day 65 – Q 1. Offlate many countries have been moving away from the international treaties for economic progress. How justified is it in terms of environmental ethics? 1. Offlate many countries have been moving away from the international treaties for economic progress. 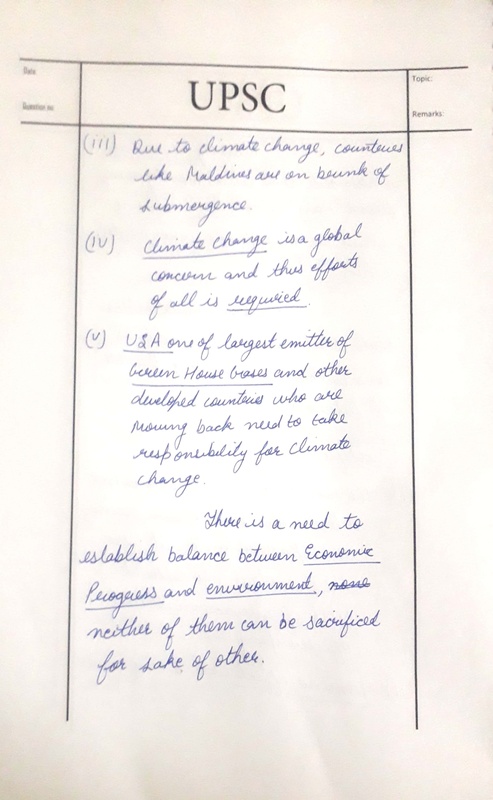 How justified is it in terms of environmental ethics? Of late, there has been news about various countries specially rich and developed countries’ withdrawal from international treaties. United States left Paris Climate Agreement and Japan withdrew from International whaling convention. 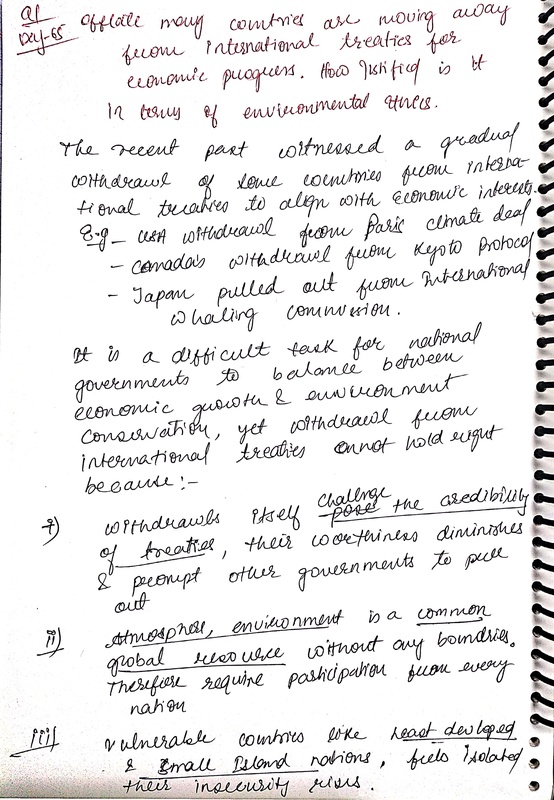 Reasons cited were economic development and negation of Climate Change altogether. Environment is a global and common asset, equally for all. Protecting it is common ethical responsibility of all the countries. 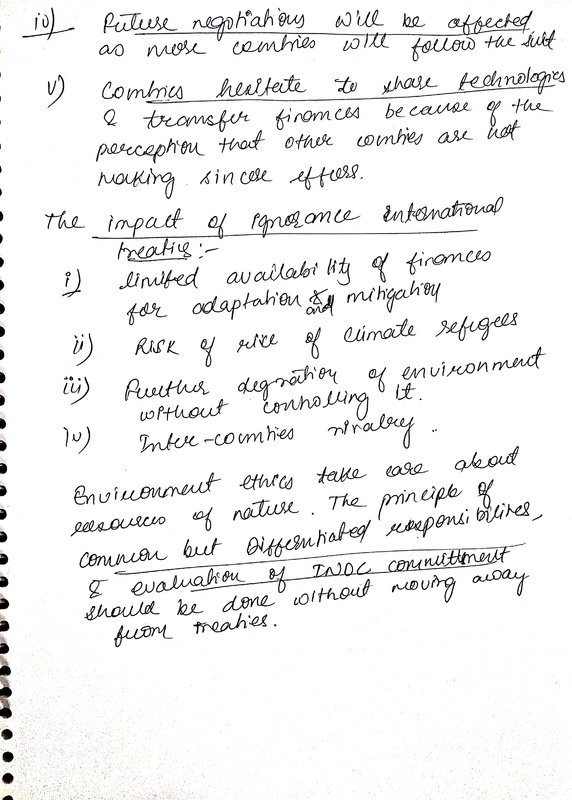 United Nations adopted a Declaration on Ethical Principles in Relation to Climate Change. Withdrawal from international treaties explains the intent of leaving countries. 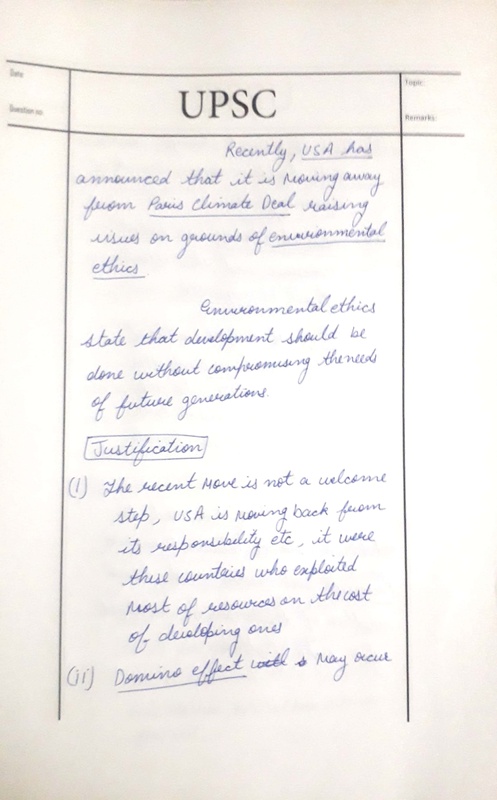 After such withdrawal, most or all of the above principles will be compromised due to lack of accountability. The recent IPCC report 2018 highlights several extreme impacts that developing countries like India would face if warming touches 2°C as compared to 1.5°C. At such critical moment, leaving international treaties is morally and ethically not at all justified. Environment and Climate change is fundamentally an ethical issue. If failure to act could have catastrophic implications, responses to climate change that are not thought through carefully, with ethical implications in mind, have the potential to devastate entire communities, create new paradigms of inequity and misdistribution, and render even more vulnerable those peoples who have already found themselves uprooted by other man-made political and ideological struggles. It will be not only harmful for other nations but also future generations of the leaving countries.